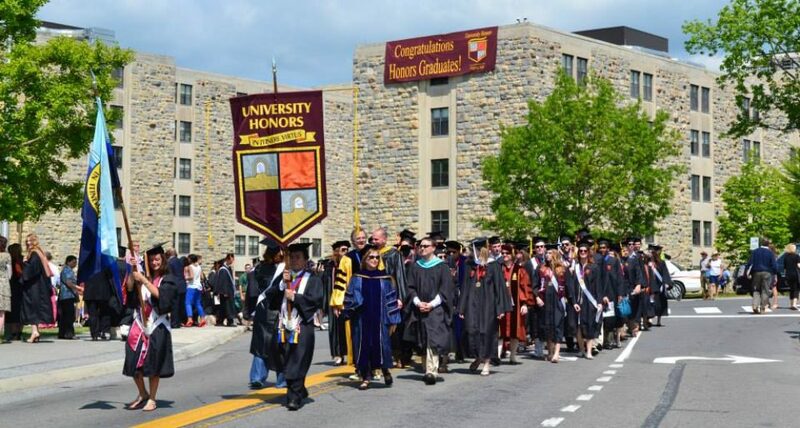 Although some honors professionals believe that separate residence halls (or sometimes floors) for honors students create an atmosphere of elitism in their programs, we do rate residence halls, and favor those that have suite-style rooms, in-house or adjacent dining facilities, air-conditioning, and relatively centralized locations on campus. We used campus maps to rate locations and spent a great deal of time researching the amenities of each residence hall. With a maximum rating of 10.0, we assigned that highest rating to the residence halls of Arizona State’s Barrett Honors College. We assigned 9.75 ratings to the residence halls of the University of South Carolina Honors College; Temple University Honors Program; Texas A&M Honors Program; and the University of Utah Honors College. Other honors colleges and programs with residence hall ratings of 9.5 or higher are Clemson’s Calhoun Honors College; the Florida State Honors Program; the University of Iowa Honors Program; the University of Kentucky Honors Program; the University of Mississippi’s Sally McDonnell Barksdale Honors College; the Texas Tech Honors College; and the University of Vermont Honors College. The University of Tennessee Chancellor’s Honors Program also has an outstanding residence facility opening in Fall 2014. Temple University Honors Program: “The Honors Program Living-Learning Community is situated in the 2nd, 3rd, and 4th floors of the 1300 Residence Hall on Temple University’s Main Campus. Located one block from the Honors Program advising office, the Honors LLC is a residential community of students in the program. The support of Honors Program staff, Honors Peer Mentors, and the Honors Activities Board helps foster relationships among upper and lowerclassmen through tailored programming and learning opportunities. University of Utah Honors College–“When the name on the primary honors residence hall is ‘Marriott,’ the chances are excellent that the hall will be remarkable–and so it is. The Donna Garff Marriott Honors Residential Community (MHRC) houses 309 honors students, 80% of them in suite-style rooms and the other 20% in traditional double rooms with hall baths. “Freshmen and upperclassmen can choose from eight living/learning themes in the MHRC: First Year Experience; Outdoor Leadership and Education; Science and Engineering; Early Access and Leadership; Intellectual Traditions, Business; Engineering; or the Thesis Mentoring Community. The MHRC is fully air conditioned with multiple lounges and on-site laundry. Each apartment suite also has its own kitchen. The nearest dining hall is at the Heritage Center, but the MHRC has its own convenience store and deli. Other amenities include cable TV with HBO package, a ski wax room, indoor bicycle storage, an honors library, and high-speed internet.